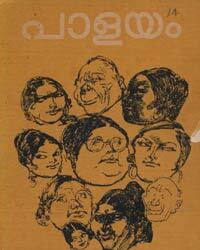 Vatsala’s novel, Palayam is like a planet. It has atmosphere of its own. There are very few writers who can not only create such an atmosphere, but the reader right in the midst of it and make him experience it. Own. It exposes many aspects of human life that we may never see unless someone shows us. is like trying to walk up an escalator that is coming down. They have to keep climbing to stay where they are. Even well meaning programmed taken up with altruistic motives turn into ritualistic gestures. The teachers spend the major portion of the daylight hours in the school with its nagging problems and petty bickering. The consequent sense of frustration and futility cast dark shadows on their private lives and make them incapable of achieving and savoring even the usual pedestrian middle class fulfillments and satisfactions. Palayam does not have a story with a beginning, middle and an end. Reading it is like standing on the bank of the river of life and looking at what is within the range of vision. Vatsala’s novel is like a planet. also place It has atmosphere of its own. There are very few writers who can not only create such an atmosphere, but the reader right in the midst of it and make him experience it. When you finish reading it you have trouble getting out of the atmosphere of pathos frustration and futility that is inherent in the tortuous trudge towards an ever receding goal. All through the novel we see the working of an immanent will that seems to deflect the principal characters from their goals. Yet the novelist’s deep human sympathy gives the story a mellowness that makes the reader realize the similarity of the lives depicted in the novel to life in general. Palayam exposes many aspects of human life that we may never see unless someone shows us.